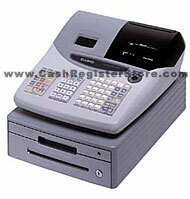 Casio PCR-T465 Electronic Cash Registers at Cash Register Store. The Casio PCR-T465 is listed amoung our low cost basic registers. Although low in cost, many great features can yet be found in this model. A staggering 24 direct department keys are standard on this low cost model. Although 96 departments are featured, there are 24 direct one touch keys to utilize before needing to use a shift level. The PCR-T465 features a high speed thermal printer with an electronic journal feature to store sales records until the end of day. A lightweight cash drawer with media slot and mini compartment tray offer multiple cash storage options. (W) 14 ½"x (D) 18 ½"x (H) 10 ¾"